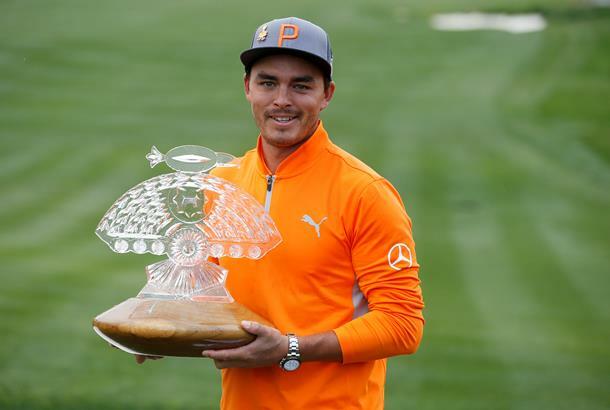 Rickie Fowler held on to win the Waste Management Phoenix Open on Sunday despite giving away a five-shot lead in the space of two holes. Rickie Fowler parred the final hole of TPC Scottsdale to capture his 5th PGA Tour title by two shots over Branden Grace on Sunday, but that’s far from the whole story. It was a day of necessary resilience as Fowler battled his game, the elements and in the case of a weird rules drama on the 11th - the course on his way to a hard-fought victory which by no means looked to be certain, even until the end. “I hope I never have to go through that again,” Fowler said after his win, which was watched by his father, mother and grandfather. He passed his winning golf ball to a his delighted grandfather when leaving the course. “The way I was playing this week, I mean, I knew it wasn't going to be easy, but I thought it was going to be a lot easier than that out there today. We got dealt a tough day of weather and conditions. There weren't many low scores. In tough, rainy weather conditions Fowler found himself four shots clear at the turn - despite a double-bogey on the 5th and an impressive up and down from a cart-path to make the turn in 37 (+2). A birdie on the 10th increased his lead, but that all but disappeared over the next two holes. There’s no question that what will most be remembered from his final round is the stressful, unlucky rules snafu that plagued Fowler on the 11th hole and saw him card a triple bogey. He’d come up short with his approach shot to the par-four, and a poor wedge shot for his third rolled past the hole, off the back of the green and failed to find enough grass to hold on to before it splashed in to the water. Having taken a drop and placed his ball, Fowler seemed happy with the lie and walked up towards the green to take a look. What he, the viewers and his caddie could barely believe, was that while he was at the top of the bank, his ball (which was now in play), rolled back in to the water to cost him a second penalty shot. A good putt for seven on that hole still kept him in front by one shot, albeit briefly, as up ahead Branden Grace was about to make a birdie on the par-three 12th. Fowler called it ‘a really good triple’. Fowler couldn’t find the green on the par-three, and failed to convert the 20-footer he’d left himself after splashing out from the bunker with his second. Meanwhile, Grace made a second birdie in a row on the par-five 13th to take the lead from Rickie with just a handful of holes to go. Finding composure from the disastrous run of holes, Fowler made two consecutive pars before taking on the par-five 15th in two and converting a two-putt birdie to pull back level with the South African. The driveable, risk/reward par-four 17th proved a critical moment for both players. Grace would end up in the water from the tee, and could manage no better than a bogey to drop one shot back. Fowler on the other hand found the green with his tee-shot, and carded his third birdie of the day to earn a two-shot advantage heading to the final hole of the tournament. Yet it wouldn’t be a straightforward par for the American. He was lucky with his lie from the tee, having driven it in to thick rough inside a bunker off the fairway, and had to hack it out as close to the green as he could muster. A clever chip put him to within five feet, and he raised his arms up in triumph as the putt for par dropped. Afterwards, Fowler - who is a two-time runner-up here, called the win ‘special’. “Yeah, this one is a little more special,” he said. “It's not just the normal event. I love the atmosphere here, I love the fans. They have always been great to me. The Thunderbirds have been nothing short of amazing to me, giving me a spot here when I was an am at Oklahoma State, like they did with Wolff this year. The Waste Management upping their title sponsorship again. They have been great here. Fowler was also keen to keep the win in perspective, paying tribute to Jarrod Lyle and another friend of his who they lost last year, and said even if he hadn’t won he would have been able to see the positives. "Trophies are great and all. And this is amazing, this is something we have wanted to, I've wanted to win here for 11 years now, since I first came, since the Thunderbirds gave me a spot. But sitting there on 11 with things kind of seeming like they're definitely not going my way, you just kind of are thinking, you know, if we finish, if we happen to finish, second, third, fourth, the sun's going to come up tomorrow, going to live another day, we're going to move forward.